Whether it’s Beyonce and her crazy cayenne/maple syrup cleanses or just a normal one I’ve heard in passing, I’ve wanted to try a juice cleanse. Initially, when I wrote this down as a goal, I wanted go for a week, then it dropped down to three days, and ultimately I decided one day would do given effort and cost (a week of juice is NOT cheap). Looking back, I’m pleased with myself for subconsciously knowing my limitations. I thought this would be one of the easiest goals to complete. I could not have been more wrong. I found this cleanse on Groupon. 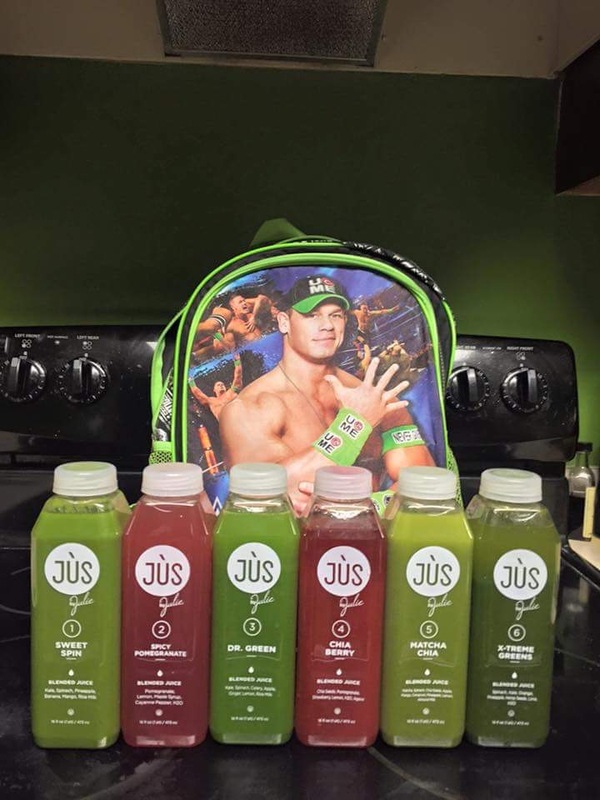 The program is “Jus by Julie.” The package consists of six different juices with wonderful ingredients like kale, spinach, cayenne pepper, maple syrup, chia seeds, pomegranate, lemon, and strawberry, just to name a few, and many of of which I love in my juices. My biggest concern was attempting this during the work week. Let’s be real, I’m a teacher and cannot make frequent trips to the bathroom during instruction time if you catch my drift, but I decided that was a risk I was willing to take. I was nervous about potential frequent bathroom breaks, but I thought this would be pretty easy… or so I thought. I woke up in the morning ready to rock. I started off with my first drink, which consisted of kale, spinach, mango, rice milk, and banana. It was pretty good. I wouldn’t have expected to like the rice milk, but I wasn’t bad. Unfortunately, two hours later, I was hungry. I held off from drinking another juice until 10. This one had pomegranate, water, maple syrup, and cayenne pepper. This was my favorite of the juices. By this point, the drinks weren’t filling me up. They just made me bloated, in a state of constant peeing, and hungry. Dr. Greens consumed. In addition to being bloated and hungry, I started to feel nauseous. I was weak and very irritable. I was having a true hangry moment. I didn’t want to teach, talk, or even move. It had only been six hours and I was hurting. At this stage, I didn’t think I would be able to finish this. This afternoon drink had chia seeds, berries, and lemon. It was nice and sweet, but I wanted actual food. The juice cleanse instructions say that one is allowed to have egg whites or steamed vegetables, but I felt like that was cheating, so I didn’t go down that route despite my desperation. Also, at this point, I realized that this undertaking was worse than running a 5K. 3:00 p.m. is also when I started to fantasize about food. I went to drink my 5th drink, but it didn’t go so well. I was feeling really queasy and I didn’t care for the seaweed flavor of this particular blend. I could only finish 75% of it. I had a headache and felt like I was going to throw up. This was a time to rejoice — the last juice. I could barely bring myself to drink it. I took two sips and I was done. Done done done. No more juices. In a haze of hunger sometime during the day, I promised myself that 24-hours after I started the cleanse, I was going to wake up and eat anything I could get my hands on. Yes, I know this goes against everything the juice cleanse was supposed to achieve, but I was desperate. 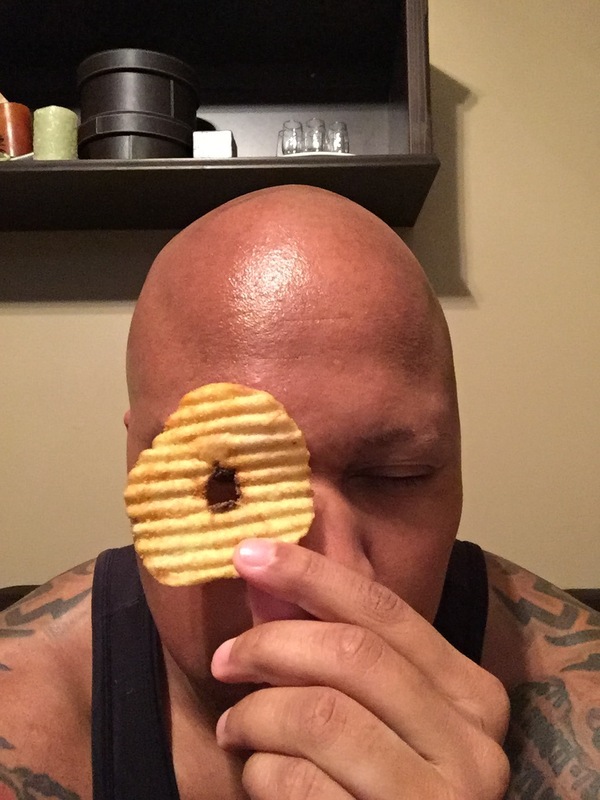 I woke up and ate an entire bag of chips. That bag was followed by girl scout cookies and chocolate toffee bites. Judge me all you want, my hungry body doesn’t give a damn. 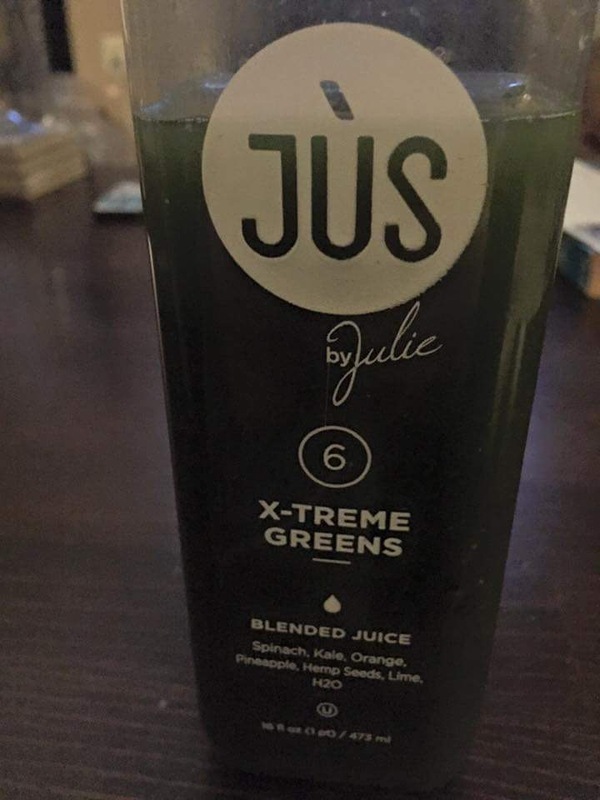 Sorry, Jus by Julie, but it’s safe to say, that my body cannot run on juice alone for a mere day, even if they are tasty and cleanse my body.